The people inhabiting Central Asia and Kazakhstan have developed their culture and arts under very special, almost unique, climatic and environmental conditions. The scenery of this enormous territory, the area of which exceeds Western Europe's, is dominated by boundless steppes merging into semideserts and deserts with dry quicksands. This arid land is dotted with small flourish-ing oases, chiefly along the banks of the two great Central Asian rivers, the Amu Darya and Syr Darya. Here one can see thriving towns and villages, surrounded by lush gardens and vineyards, emerge like mirages of fabulous beauty. The region between the Amu Darya and the Syr Darya, and the fertile valleys at the foot of the lofty Pamir mountain ranges, supported some of the earliest known human civilizations. The archaeological map of the area is studded with the illustrious names of world-famous cultural treasures, some of which date back to the Paleolithic period. The earliest of them is the Neanderthal cave burial at Teshik-tash, dating back to dozens of millennia before Christian time. Primitive societies were superseded by powerful slave-owning empires, a succession of which emerged and collapsed before gigantic feudal states and small emirates arose in their stead. Reminders of those days are still to be found, such as the ruins of palaces with antique statuary in Merv and Toprak-kala, old Khwarazm's citadels buried in sand, the magnificent buildings with resplendent blue domes from the age of Tamerlane and his successors, and stone figures commemorating fallen warriors or chieftains. For centuries the development of art in Central Asia and Kazakhstan was determined by the coexistence and interpenetration of two different cultures- one with a settled agricultural population and the other with nomadic or seminomadic livestock-breeding tribes. 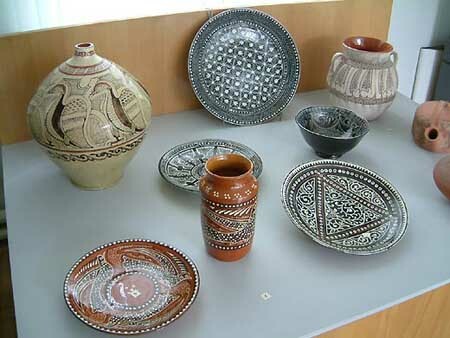 The two life-styles generated different arts and crafts. In Uzbek and Tadzhik towns some articles were made by craftsmen grouped in workshops, while others were made at home and traded locally. In the countryside, especially in the nomadic auls of Turkmenia, Kirghizia, and Kazakhstan, many handcrafted objects were produced solely for domestic use. An important unifying factor in this region was that it belonged for a long time to the Moslem world. The Arabs, who invaded Central Asia in the eighth century, introduced Islam, which banned the depiction of human be-ings or animals in works of art. As a result, the ornamental trend was the dominant one in their art for centuries, and their skill in elaborating plant and geometrical designs was brought to perfection. Formalization and generalization, inherent characteristics of the decorative arts, became practically canons in Central Asia. This, however, did not prevent each community from evolv-ing its own distinctive idiom for expressing its world view and ideals of beauty.